So the Equinox 40k event has been run and won, and the results are in. So 18/36 power armour (including the sisters). Mean while, the average for the entire event was 58.94 (while the median was 57) battle points. 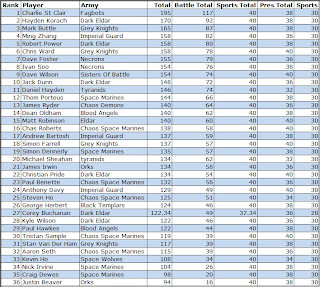 Yeah the averages for the armies which only show up once aren't massively helpful, and the large number of Dark Eldar evens them out (3 in the top 10, 3 in the bottom 15). Only Dark Angels and Tau aren't represented though which is a pretty good spread. Still a few surprises for me in terms of this breakdown, the number of Dark Eldar is pretty impressive but it seems to come at the expense of Eldar (who had 4+ at most of last years events). Only 1 Space Wolf player is also surprising, given that its widely considered a top tier codex. Congrats on yet another win Charlie. Any chance we get to see the Wolves or Orks at some point this year? I spent the weekend bouncing between 20-0 and 0-20 to end up 4th equal (5th on BP), which I'm pretty happy with. I'll most likely wait until people change their lists to deal with my Necrons. At that point I'll change again (and hopefully pre-empt it to be at the very same event). One person so far has gone out of their way to make a list that can handle my necrons, but while their intent was solid they pretty much picked _the_ codex/build type that I am best at, so inadvertantly they gave themselves one of the lowest chances possible against me. I did warn them in advance, but I guess the wheels were in motion already. Lol so we need to lead you into changing to your space wolves while secretly planning to take on the space wolves? BUT THEN THE ORKS COME OUT, SURPRISE :E! Haha, nah - just Angry-Dave is a boss as long as you trick him into believing a pool is in the building. I know I played Dan like a complete and utter muppet, but the more I think about the game I had against Jack the more I am thinking that I could have done a couple of other things that would have given me a chance against him, instead of just capitulating.